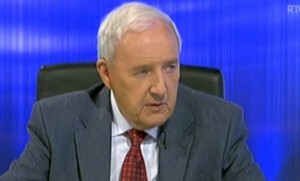 RTE broadcaster, Bill O’Herlihy, has said he was “shocked” by the Vatican’s treatment of Fr Tony Flannery. He was launching the censured priest’s new book, ‘A Question of Conscience’ at the Royal Hibernian Academy on Thursday evening. To a packed room of 300, Bill O’Herlihy, who is a daily Mass-goer, hit out at the Irish bishops “who seemed to possess no real leadership” and had allowed the Vatican’s Congregation for the Doctrine of Faith (CDF) assume more and more control of the Church. “Consider the facts for a moment: the Vatican Congregation for the Doctrine of the Faith made accusations against Tony, passed judgment against Tony and decreed penalties to be imposed on Tony before Tony was aware anything was happening. How can this be justified?” he asked. The sports commentator also questioned why the Vatican refused to deal directly with the Redemptorist in spite of the seriousness of the accusations levelled against him. Last January, Fr Flannery (66), who has been a Redemptorist since 1964, revealed that he had been threatened with excommunication by the CDF over his views on women priests, contraception, the priesthood and celibacy. He was told he could not minister as a priest and remain in his order unless his recanted his views publicly. Speaking after the launch to CatholicIreland.net, Bill O’Herlihy described Fr Flannery as “a very special priest” and urged him to remain in the priesthood saying he was the kind of cleric who sustained the faith of people like him. Fr Flannery told CatholicIreland.net that his legal advisers were shocked at the CDF’s procedures, which they regarded as being completely contrary to the normal processes of civil law. These included not giving him an opportunity to defend himself and not providing him with access to relevant documentation.